Installing third-party apps on an iOS device is not an easy job especially when the device is not jailbroken. 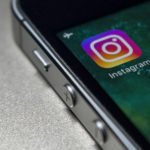 To make it easier, there are couples of apps available that allow the user to install a third-party app on their device. Yes, we are talking about apps like TuTuapp, AppValley, Tweakbox, etc. Have you ever tried such apps on your iOS device? If you tried them, there are chances may you also encountered problems like app revokes and app crashing. Are you facing the same problem? Well, app revokes and app crashing is the very common problem in apps like TweakBox. 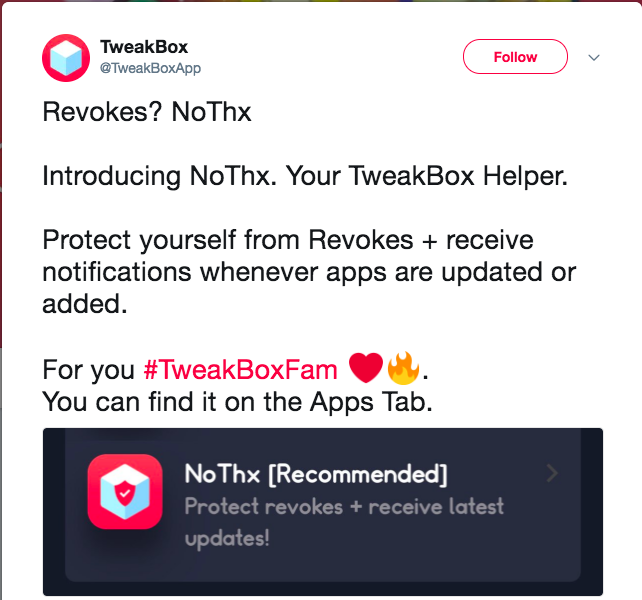 TweakBox has recently released a new app called NoThx. The main purpose of this application is to prevent the revokes and app crashes. Simply download and install this app on your iOS device to fix such problems. We also an alternative app guide here in our site: Do check it out the complete step by step tutorial, NessTool – Stop Apps Getting Revoked. TweakBox is one of the best third-party app stores that are designed for iOS devices. Getting engaging with this application, you can download any number of paid applications at free of cost. There is no need to pay a single penny in order to download an app from TweakBox. In this app, you will find modded, tweaked, and many other apps that are available on the Apple’s app store. One of the major key features of the TweakBox is there is no need to jailbreak your device in order to install third-party apps. What is NoThx from TweakBox App? 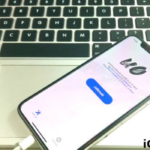 NoThx is an anti revokes application specially designed for Apple device. The NoThx doesn’t let the Apple detect the modded or tweaked app on your iOS device. So, without wasting time let’s proceed to the guide. Here below is the guide to know how to download and install this on an iOS device. First of all, you have to open a web browser and visit TweakBox Web page. 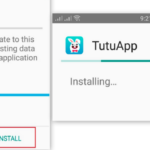 Once the download process completed, your iPhone device will ask you for confirmation, simply tap on the “Install” button. The installation process will take a couple seconds. Go to the home screen and navigate to the TweakBox app to open. On the TweakBox interface to search for the “NoThx” and hit on the “Install” button to start the download process. Now, you have to trust the developer by going to the “Settings” and hit on “General”. Under the General, find the “Profile and device management” and select it by tapping. After that, you have to trust the NoThx app profile by hitting on the “Trust” button. So, these are steps on how you can download and install NoThx on your iOS device in order to fix the app revokes and app crash problems. Simile App like NoThx App: Anti Revoke App on iOS 12, iOS 11.3.1/11+ iPhone/iPad. Cydia Impactor Guide: Fix** How To Fix Cydia Impactor “http-win.cpp:160” Error. 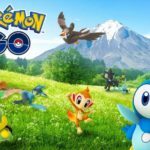 App revokes and crashing is a common occurs especially in apps like TweakBox. In a search for a solution to fix this problem, we find NoThx App is best. 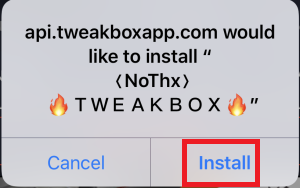 This app from TweakBox will prevent app revokes and crashing on your iOS device. Here above in this post, we have provided complete detail guide on how to download and install TweakBox’s NoThx. Have any queries or suggestion? Let us know about your experience with the NoThx free app in the comments below. I had NoThx on my iPad Air 2 iOS 11.4 open and protecting my device and still ended up getting apps revoked. What happened? Did it time out or something, leaving me unprotected? I really don’t know, and am left to guess and wonder why. Very frustrating! I hope any of these anti revoke apps can help you to fix your issue. Thank you.